The first letter of a person’s last name determines the renewal month if the vehicle is registered in the individual’s name. The renewal month for vehicles that are registered to two people is based on the first person listed on the registration. Vehicles that are registered in business names (or have been classed as commercial) renew in October and November each year. All late registrations and renewals are subject to late penalties and interest. To avoid delays, please bring your valid, unexpired driver license AND insurance card with you to the office or include copies of them with all mail renewals if possible. License plates must be renewed annually. The official notice to renew the license plate for a vehicle is the vehicle’s registration. Some counties, including Tuscaloosa County, mail out courtesy reminders to renew license plates. However, the failure of a person to receive a reminder notice does not waive any penalty or interest charges levied under Alabama law. If your address has changed since the last time you renewed your license plate, come in person to renew. Do not mail in your payment! Your tax district may have changed, and the cost printed on your renewal notice may be incorrect. Remember: Failure to renew your license plate during your scheduled renewal month will result in penalties and interest. In accordance with Act 2011-688, effective January 1, 2013, license plate issuing officials must verify the insurance status of vehicles prior to each license plate transaction. Alabama law provides that no person shall operate, register, or maintain registration of a motor vehicle designed to be used on a public road or highway unless it is covered by a liability insurance policy. Licensing officials must use the Online Insurance Verification System (OIVS) in order to verify the insurance information for all personal insurance policy holders. Registrants must provide the insurer’s NAIC and policy number for each vehicle registration. If this information cannot be verified through OIVS, the registrant will be required to present a copy of evidence of insurance, most commonly an insurance card. Prior to renewing or registering vehicles, driver license and non-driver ID cards for all owners on record must be verified. ALVerify can normally be used to verify Alabama driver license and non-driver IDs, but valid, unexpired out-of-state driver licenses or non-driver ID cards should be presented at the time of each license plate transaction. If a vehicle owner is deceased, that person’s name will need to be removed from the title and registration prior to renewing the tag. Commercial and fleet policy holders must present copies of their current fleet or commercial insurance card or policy at the time of all license plate transactions. For additional information on the insurance law, please visit www.besuretoinsureal.com. Periodically, the state sends out requests for insurance information for vehicle owners. If the state sends a request to a person and does not receive a response, the state suspends that person’s license plate pending verification of insurance. The state will also suspend a person’s license plate if the insurance company denies that a vehicle was covered on the verification date. If your license plate has been suspended for MLI reasons, you will have to reinstate your license plate before being able to renew it. In order to reinstate your vehicle license plate, bring in your proof of insurance from the date the state asked you to verify along with your current proof of insurance. To reinstate a license plate after the first offense costs $200, while the second offense costs $400. Reinstatement payments are accepted in the form of certifies funds, e.g. cash, money order or cashier’s check. The License Office can reinstate most vehicle license plates, but not all. If you have any questions about MLI issues, please contact the Alabama Department of Revenue – MLI Section. They have a local office at 1434 22ND Avenue, Tuscaloosa, AL 35401. The telephone number for the local ADOR Taxpayer Service Center is (205) 759-2571. Alabama law provides 20 calendar days for the new owner of a vehicle to purchase a license plate. A new resident in Alabama has 30 calendar days to transfer his or her out-of-state registration to Alabama. Alabama law requires that a vehicle’s current (unexpired) registration and insurance be kept in the vehicle at all times. The person driving the vehicle must also keep his or her valid driver license in the vehicle. Please be aware that the requirements below are general, and that other documentation is sometimes required in order to process a title and/or registration. Every situation is different, and until all paperwork can be examined, there is no way to know whether or not any additional documentation is necessary. Vehicle must be brought to the License Office for inspection if using a Manufacturer’s Statement (Certificate) of Origin or a title from another state. Vehicle must be brought to the License Office for inspection. * Some states send the valid original title to the owner, not to the lienholder. Persons registering vehicles from the following states must surrender their out-of-state titles in order to apply for Alabama titles: Kentucky, Maryland, Minnesota, Missouri, New Jersey, New York, Oklahoma and Wisconsin. * Michigan, Montana, South Dakota and Wyoming give the vehicle owner the choice of having the title mailed to the owner or to the lienholder. Persons registering vehicles from these four states must either surrender the original title or provide proof that the original title was mailed to the lienholder. Registration Fees are generally comprised of 3 parts: a license plate fee (varies according to the license plate type), an issue fee ($1.25) and ad valorem taxes (which vary depending upon the market value of the vehicle and the tax district of the owner of the vehicle). However, additional fees and/or exemptions may apply depending on the type of license plate selected and the eligibility of the registrant. When applicable, payment of sales tax will also be required. The license plate required for a vehicle will vary depending upon the type, use and weight of the specific vehicle. Most vehicles, however, are eligible for a number of different style license plates. The State of Alabama has a large number of special license plates in addition to the standard county tag from which to choose. Most special license plates vary in cost from the standard tag, and some require proof of eligibility in order to purchase. Please visit the links below for information on specific license plates, and their uses, costs, requirements and restrictions. Many license plates may be personalized. To check the availability of your desired personalized message, visit the following website: https://pros.mvtrip.alabama.gov/Public/Create. Select whether the personalized license plate is for a passenger vehicle or motorcycle and follow the prompts. Only letters, numbers and spaces are acceptable characters for license plate messages. Dashes and all other special characters are not possible. Personalized tag reservations made through the site are only valid for a limited period of time. If you choose to reserve a personalized message through the site, you must still come to the License Office to order the license plate. If your reservation expires before you have ordered the tag, the tag message will be released, and anyone can get it. If you are planning to upgrade the current license plate on your vehicle, you must bring the valid license plate from the vehicle. However, if you are reserving a message for a renewal or for a new purchase, there is usually no need to bring in the previous license plate. Ad valorem tax is the property tax on the vehicle that is paid each year when purchasing a license plate. The amount of ad valorem tax due is based on the tax district in which the vehicle is located and the “class” of the vehicle. Class IV motor vehicles are assessed at 15% of the market value – All private passenger motor vehicles to include private passenger vehicles under lease-purchase option, vehicles registered in name of a trust or beneficiary, station wagons, sport utility vehicles, vans and “pickup” trucks with an option to purchase, which weigh twelve thousand (12,000) pounds gross vehicle weight (GVW) or less that are owned and operated by an individual for personal or private use and not for hire, rent, or compensation. Class II motor vehicles are assessed at 20% of the market value – All motor vehicles that do not fall within the definition of either Class IV or Class I motor vehicles. This class includes motorcycles, trailers, recreational vehicles, leased vehicles not for private use and without lease-purchase option contractual agreements, trucks weighing more than twelve thousand (12,000) pounds gross weight, and all vehicles used for commercial purposes. Class I motor vehicles are assessed at 30% of the market value – All motor vehicles owned by public utilities and used in the business of such utilities. The ad valorem tax on used vehicles is normally paid at the time of registration forward until that person or business’s renewal month. For registrations of new Class IV vehicles only, if the new vehicle was purchased outside of that person’s renewal month, the ad valorem tax is deferred until that person’s next renewal month. However, if the new vehicle was purchased during that person’s renewal month, the ad valorem taxes are not deferred, and must be paid at the time of registration. Upon the sale, trade, total destruction, permanent removal from Alabama, theft without recovery, or other transfer of a motor vehicle, the owner may apply for a prorated credit for the ad valorem taxes paid for the remainder of the current period for which ad valorem taxes have been paid. No vehicle taken out of service by the owner is eligible for ad valorem tax credit. Ad valorem tax credit can only be requested in the county in which the license plate was purchased, and a person has up to 12 months from the date of the disposition of a vehicle to apply for ad valorem tax credit. The credit may be used to pay ad valorem taxes on a replacement vehicle or other vehicles acquired by the owner. If the ad valorem tax credit is not used at the time of application, a refund check for credit will be sent to the owner. Refund checks are normally mailed by the 20th day of the month after application for ad valorem tax credit has been made. However, the ad valorem tax credit, at the direction of the owner, can be transferred to a spouse or dependent child only, or the person or corporation that shall have rented or leased the motor vehicle from the owner. Vouchers shall be supported by the proper documentation. This must have a complete description of the vehicle for which credit is being requested. 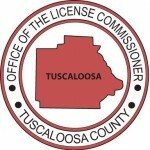 If you have any questions concerning the registration of vehicles and the information contained herein, please contact the Tuscaloosa County License Office at (205) 464-8233.